On Monday, June 5, 2017, the conference “The Promise of Space Resources: a Luxembourg Public-Private Initiative” was held in New York. Around 180 people from the business community took part in this conference organized by the Luxembourg Trade & Investment Office in New York on behalf of the Ministry of the Economy and with the support of the American Industrial Acquisition Corporation. 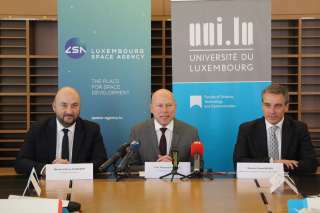 The Deputy Prime Minister, Minister of the Economy, Etienne Schneider elaborated on the Luxembourg SpaceResources.lu initiative and its goals, and corporate experts from the space industry and from private equity investment provided insights in to investment opportunities and financing of space exploration. Luxembourg’s strategy is built on support for advanced research activities and technological capabilities, drawing on the country’s existing expertise in the space sector and its ongoing strategy of economic diversification into future-oriented high-tech industries. As a world renowned financial business center, Luxembourg offers incentives for private sector companies seeking to develop space mining opportunities. Our financial regulatory system fully supports venture capital and private equity investment within a wider European framework. We already have a whole scope of competences around space in Luxembourg and we have been focused on commercial space activities since the beginning. Now, our main objective is to encourage the private sector to develop technologies needed for space resources exploration and utilization. These technologies have the potential to create short term revenues in space and terrestrial applications and will lead to completely new business models in the mid and in the long term. During two panel discussions, corporate and institutional experts in space exploration and private equity investment debated on the two subjects of “Space markets and corporate strategies” and “Connecting investors and space explorers”.